Whether it be trick-or-treaters, personal Halloween parties or a dinner party that ends in the crisp air on the patio, fall is full of opportunities to entertain. As the weather cools down, few things improve an evening gathering of friends like a fire to gather around. Even if you have a smaller outdoor space, there are options for lighting up your personal smaller sized bonfire. If you’re trying to decide what kind of fire pit might be the perfect addition to your home, here are a few creative fire pit types to get you started. There can be endless variations on the classic theme of stone fireplaces. You can build stone fireplaces in a more rustic direction, using rough stones and cement. Opting for trimmed, filed flagstones or other uniformly shaped stones can create a sleeker look. 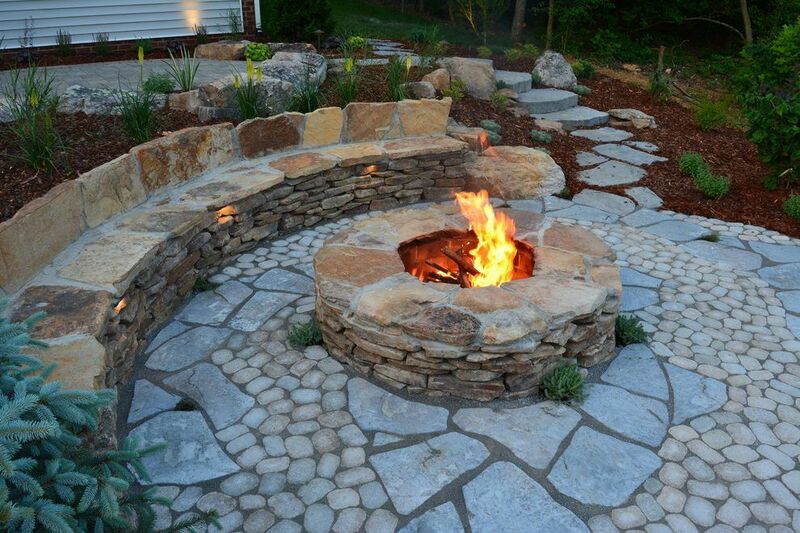 However you construct them, circular stone fire pits are durable, timeless and easy to clean. If you’re wanting a clean, modern approach to a fire pit fixture, cement bowls can be a simple and affordable option. Although it’s possible to DIY the smaller ones, if you’re wanting a more dramatic statement piece, you’ll need a professional (like WillowTree) to help cast and install it. In addition to the fact that this is a visually clean option, cement bowls are durable and easy to clean. The tabletop fire fixture is a low space solution that has been growing in popularity in recent years. It can take the form of a long rectangular trough, or a rounded bowl. Most of the time, it will be either gas or gel fueled. If you enjoy the idea of a little more light and heat with a really big wow factor, this could be a good option for your entertainment space. You may have even seen these picking up popularity in restaurants and bars, and it’s easy to see why: they’re affordable, generally fairly safe due to the lower-burning flames, and endlessly mesmerizing for guests to watch. This kind of fire pit has the benefit of being mobile, making it versatile and easy to fit to your given space — even if you move. Free standing fireplaces come in a wide variety of shapes, sizes and materials. The most popular material is metal, given its durable, heat-resistant qualities. There are near endless shapes and sheens available in basic metal frameworks. However, if properly protected, free standing fireplaces can also be made of wood, ceramics or even feature stone elements. The self-contained fire pit’s cousin is the chiminea, which could be an option if you’re in a burn-hazard area where you really need the sparks to stay contained. Chimineas are enclosed, free standing outdoor fireplaces cast with a chimney on top. They can also be ceramic or metal. Whatever fireplace structure you choose, you’ll also want to consider what fuel you want. Although wood burning fireplaces create a classic ambiance and can be ideal for cooking, gas fireplaces are simpler and cleaner to operate. If you need professional help deciding what is best for your space and how to make your home inspiration a reality, contact WillowTree to find out how we can help!